With long hours, endless hard work and talent, nurses are the backbone of the healthcare system. 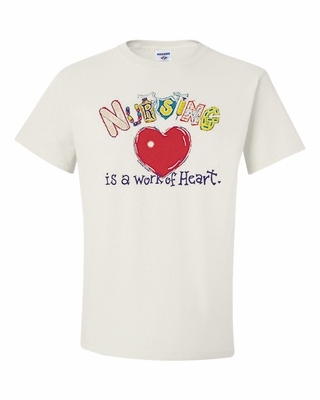 Show your appreciation to your favorite nurse with these Nursing is a Work of Heart T-shirts. An especially great gift for a cardiac nurse, these Nursing is a Work of Heart T-shirts are also available as a cardiac nurse coffee mugs. Considering the long hours, these cardiac nurse coffee mugs make a great gift. No matter the type of nurse, nursing is a work of heart, so show your appreciation to your hardworking nurse with this nursing T-shirt. Remember� you found the Nursing is a Work of Heart Shirts at TShirtHub.com, where high quality came at a low price.